Looking for Investment Properties In Jacksonville? If you’re looking for investment properties In Jacksonville then you’re probably aware that every investment should be carefully considered before you make the investing commitment. At Acumen Investments, LLC, we’re here to help! In this blog post you’ll learn 4 questions you need to ask to complete your due diligence on your next real estate acquisition. Question 1. Does It Fit Within My Investing Parameters? This fundamental question makes sure that you always keep your investing method in mind before you invest. Are you a cash flow investor? Then you’ll want properties you can rent. Are you a rehabber? Then you’ll want properties you can rehab. Think about the type of exit strategy you have and make sure that the investment property In Jacksonville you’re looking at will fit that strategy. Question 2. Is The Investment Property In Jacksonville Below Market Price? This question looks at the investment price of the property and considers it against the potential market price of the property. In this way, you are ensuring that you are getting some “built-in” ROI when you invest in this property since you could theoretically turn around and sell it on the market. You can have a real estate agent run some comps to give you a market price, or you can work with a real estate investing company that specializes in selling below market properties. Question 3. What Will It Take For Me To Get This Ready To Profit? This is an important but often overlooked question. Some investors will go out and buy a run-down property because the price is low… only to overlook the fact that they have to spend the money to get the property ready to rent or sell. By buying investment property In Jacksonville from a company like Acumen Investments, LLC, you get the best of both worlds – properties that are attractively priced, AND are already in pretty good shape to rent or sell. Question 4. How Quickly Will The Steps Take To Acquire And Generate ROI? 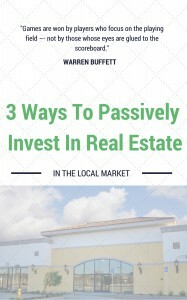 This question continue the same line of thinking as question 3 by asking, “how long before I start making money?” An investor who buys a property only to have to spend months getting it ready will end up paying extra in carrying costs and will delay the return on their investment, compared to those who invest in investment property In Jacksonville that are ready to be rented or sold. The rapid turnaround time between acquisition and ROI is a crucial piece of the investing puzzle. Income Properties In Jacksonville With A 401(K)?